Tokai Forum - a subsidiary of TokaiRegistry.com :: View topic - 12 screws but maple neck on a ST55. Fake or ... ? 12 screws but maple neck on a ST55. Fake or ... ? Posted: Fri Aug 08, 2014 11:47 am Post subject: 12 screws but maple neck on a ST55. Fake or ... ? Are there many maple neck 50's replicas but have the 60's 12 screws instead ? No that is not right.it`s been mucked about with. Gabe. Although it's got 11 screws, not 12.
good spot about the 12 screws, although once knew a lad at school who claimed he could prove that 1+1+1=2. E mailed the seller about this inconsistency, he has yet to get back to me. You reckon he's stuck a 60's body and a 50's neck together ? or maybe drilled some extra screwholes ? Dont know which of those is worse from a purists point of view, althoguh apprently does have the gray botttomed pups. I'm stilled tempted though , love that particular red. Its a toss up between that and a Goldmist Goldstar with the tuners ripped out then stuck back. Most likely it has a replacement pickguard. 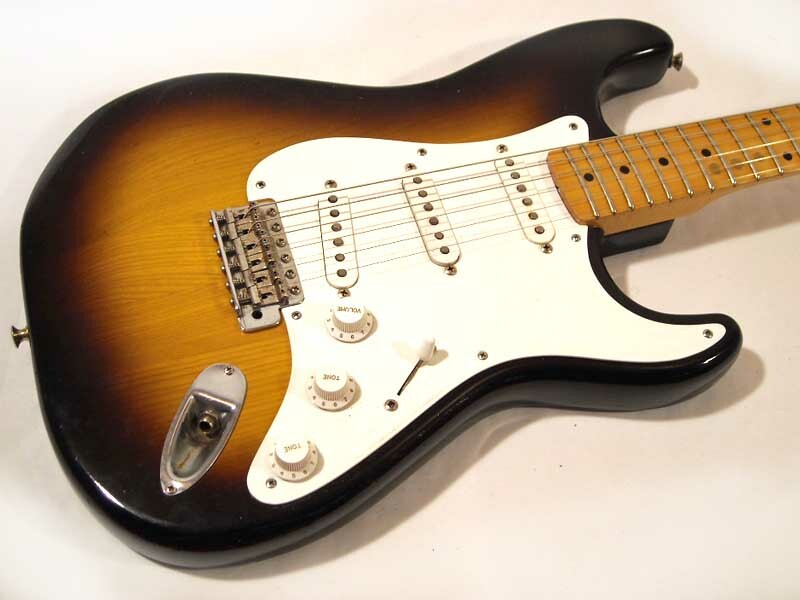 http://www.gumtree.com/p/for-sale/tokai-goldstar-tst50-made-in-japan-strat/1076379972#gallery-item-full-4 For sale again without the description "all original".Still the same price though. I have seen this a few times on different Tokai guitars. I think this happened at the factory.